India trip dates: July 2nd – July 14th/17th, 2016. Join us on our 6th trip to India in 2016 to run a large teacher conference at The Torchbearers Center in Dehradun. It’ll cost approximately $3000-4000, and we need 5-9 awesome NZ teachers to join us. 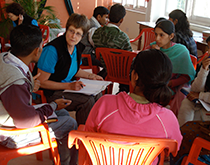 We will be again at the Himalayan Torchbearer Centre training the teachers we have worked with over the last few years. We hope to teach 40 teachers during an intensive week, as well as meet with each individual school we work with. This year we will have a real emphasis on training some of them to be trainers themselves. We have great friendships with our Indian colleagues and are so keen to continue to work beside them again this year. It is mango season as well and this year we visit Armistar, where the Golden Temple is. If you’re interested in joining us, fill out the Application Form here or simply contact us at ratasupport@gmail.com for more information.